Justice Samuel Alito has been scouring the land looking for a case to make his mark on history. Could he find a way to hold a big bank accountable for ripping off millions of consumers? Could he interpret intellectual property law to give more desperately ill people access to essential medicines? Could he hold a chemical company to account for poisoning people and hiding it for decades? No. Alito apparently decided to make his mark by helping a massive right-wing funding machine crush wages for teachers, nurses, firefighters, cops and prison guards. The case is Friederichs vs. California Teachers Association will be heard on Monday at the U.S. Supreme Court. There will be a big crowd outside. Those cheering on Alito on have been called to action by the the State Policy Network (SPN), an $84+ million network of state-based "think tanks," funded by the Kochs, Bradley, and others with close interlocking ties to the American Legislative Exchange Council (ALEC). CMD first documented this anti-worker Koch-ALEC-SPN agenda in a 2013 report. Today, CMD obtained a rally flyer with the SPN logo on it. Also putting out the call to come to the court Monday is Americans for Prosperity, the Kochs' phony astroturf group, which will soon unveil its StandwithRebecca.com website. The Kochs are so extreme, they not only want to get rid of unions, they want to get rid of the minimum wage. The phony grassroots support for the case makes a lot of sense. Friederichs seeks to overturn decades of law and tradition as well as the 1977 unanimous Supreme Court ruling Abood v. Detroit Board of Education, which upheld the legality of "agency shop" arrangements. These allow public sector unions to assess a fee to non-members in a workplace to cover the costs of collective representation. The case was rushed though the lower courts, because in a series of recent labor cases, Alito hung the red lantern – signaling to far-right ideologues and their billionaire backers that the conservative majority might be prepared to destroy the last best voice for Americas working families – unions. Now, a raft of Koch and Bradley funded institutions have answered Alito's call. These powerful groups found ten, yes ten, teachers out of California's hundreds of thousands to tell the court that their "free speech" rights are harmed by paying agency fees, even though they benefit from the higher pay and benefits that unions bring. In These Times noted that "if successful [the case] would affect tens of thousands of union contracts and would force millions of public employees into a right-to-work model." 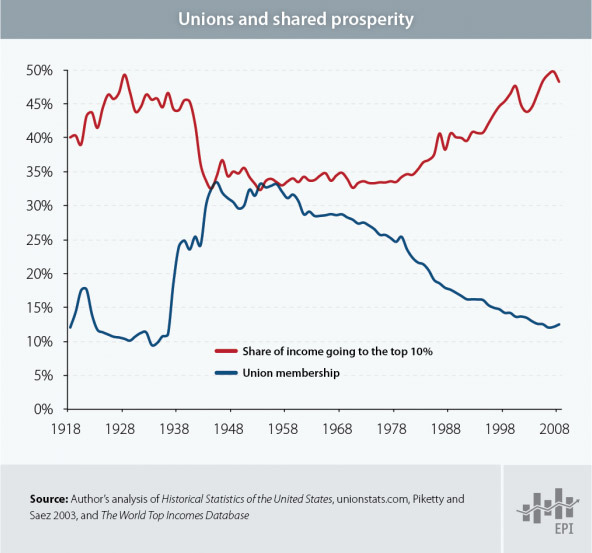 If you want to know what unions do for America, take a look at this chart. The collective voice of workers standing up to CEOs for better wages, worker safety, health care and pensions, built the American middle class. As unionization declined, so did the middle class. Wages have been stagnant for decades, not because the economy wasn't doing well but because workers did not have enough power to demand their fair share. In 2015, for the first time, the majority of Americans are no longer middle class. If you want to know what "right to work" laws bring check out these studies from the Economic Policy Institute. They show that weaker, smaller unions mean lower wages, fewer benefits and more dangerous working conditions. That is the legacy Alito appears ready to embrace. The case that could cripple public-sector unions zoomed thought the courts specifically to climb into Alito's lap and the lawyers for the Center for Individual Rights (CIR) are ready to dance. When CIR first filed its lawsuit in California, they didn't demand their day in court. They literally did not care what the lower courts had to say about its case. The group made the unusual request that the California District Court rule against them, and in favor of the unions, so they could get the case to SCOTUS as quickly as possible. In 2013, a California court granted CIR's request, and in 2014, the 9th Circuit Court of Appeals affirmed without argument. In 2015, CIR asked the Supreme Court to take up the case, and the Court agreed. The strategy is "nefarious," Frank Deale, a professor at the CUNY School of Law told American Prospect. "In fact, it's collusive, in a way. You're setting up this false scenario, this false conflict, in order to get a Supreme Court ruling. The Center for Individual Rights didn't even make an argument [in the lower-court filings]. They asked for the court to rule for the defendant, and then they got rewarded for it." CIR's single-largest funder is the Milwaukee-based Bradley Foundation, a $350 million institution that also bankrolls groups like SPN and ALEC. Bradley has been led for decades by Scott Walker's longtime campaign chair, Michael Grebe. With the support of Bradley and the Kochs, ALEC alum Scott Walker decimated Wisconsin's public sector unions in 2011 and now CIR seeks to take the Wisconsin model nationwide. The groups lining up in support of CIR's position with a raft of amicus briefs are largely funded by the same deep-pocketed, right-wing donors. Plus, dozens of briefs came in from the SPN "think tanks" across the country giving the phony appearance of broad, national support. Dozens of groups have filed amicus curiae briefs in support of the anti-union position. While the list seems impressive, the vast majority are funded by the same big money donors. Their goal is clear. "Together, we have diminished government union power while providing union members a shelter from union bullies," Freedom Foundation CEO told to supporters last year. "We have implemented a plan to bankrupt SEIU, our state's largest union." The group explained that they want to force unions to spend money playing defense, because they bankroll liberal causes, government programs and Democratic candidates. "State Public Policy Research Organizations" -- this is a cluster of mostly SPN groups, including Beacon Center of Tennessee, Freedom Foundation of Minnesota, Idaho Freedom Foundation, John Locke Foundation, Kansas Policy Institute, Oklahoma Council of Public Affairs, Rhode Island Center for Freedom and Prosperity, Rio Grande Foundation, Show-Me Institute, Washington Policy Center. Commonwealth Foundation, Civitas Institute, and more. See CMD's SourceWatch for more on SPN. Jessica Mason and Nick Surgey contributed to this article. Great article connecting the dots between some members of the #KochNetwork and how they collude in common agenda. I'm shocked if it was so corrupt that they could just shove the case upwards. did the lower courts get lazy or did they follow the ideology of the elites?